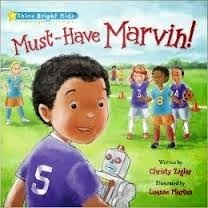 "The second title in the Shine Bright Kids series, Must-Have Marvin! teaches children that people are more important than things. Marvin loves new things—he especially loves finding the latest, greatest, most awesome new things! Soon Marvin finds himself focusing on a new robot that he wants, to the exclusion of his friends. He lets them down when they need his help and nearly loses their friendship. Through a chat with a wise neighbor and a second chance to help, Marvin learns the important life lesson that people are more important than things." "The Shine Bright Kids series provides children and their families with a framework to teach the importance of making good choices. The principles that will be explored include: using good judgment, taking responsibility, having a positive attitude, and demonstrating perseverance." My kiddos range in ages 4-10, and they really enjoyed this story. They had me read it 3 times in a row. It has the children looking for a star on each page. The choices that Marvin makes determines how the star will look. This created great discussions for my children and I. I liked that Marvin had to use his own money to purchase what he wanted. My youngest is still learning that she can't always have what she wants. Especially when she has spent all of her money. The even greater lesson in this book is that "stuff" can't make you happy. Family and friendships are more important. Thanks to her first-grade teacher, who recognized her superior skills in drawing a robin, Luanne Marten has been drawing, painting, and sketching ever since. She is a great experimenter and has a fresh, whimsical approach that brings her characters to life. You can enter to win your own copy of this book!